The New York International Auto Show is a 10-day event, held every year that attracts over one million people to the Big Apple to view the world’s nicest cars. If you visit you can find any type of car you desire, such as luxury, sport, or even the ones you look at but know you’ll never afford. This year alone, the auto show has attracted over one million people to the Javits Center in New York City, where almost 1,000 vehicles are on display to be viewed by thousands everyday. You could find any vehicle you desired from Toyota, Honda, Hyundai, Jeep, Porsche or even a Maserati if you desire. If you get a chance, you should stop on by and enjoy. The show itself premiered several new cars that are being released this upcoming year. For example, the Dodge Challenger SRT Demon, that has a maximum output of 840-horsepower; only 3,300 will ever be built. Aside from sports cars, there is Jeep who is releasing the Grand Cherokee Trackhawk that is made for improved pavement performance with 707-horsepower. Honda is releasing the Clarity a new Plug-in Hybrid is a new car being powered solely by hydrogen. Hyundai’s luxury brand, Genesis is set to compete against established rivals such as Mercedes-Benz or Lexus; the sleek look has very small headlights preparing for a time where they will no longer be necessary as cars will drive themselves. This year, Buick is releasing a new and redesigned station wagon, the Regal TourX that Buick says is a crossover SUV designed for ground clearance and roof rails to hold cargo. Mercedes released the AMG GLC 63, their new high performance SUV that has a maximum of 503 horsepower. Nissan releases its new performance car the GT-R Track Edition designed to have a maximum of 600 horsepower. If you know anything about cars, you know that these new improvements and new releases are hard to grasp as these big name companies are making cars, bigger, stronger and faster. This year, these companies released many new designs and newly manufactured cars designed for all different needs. The new cars are designed for racing, comfort, luxury, etc. At the auto show you will find a car for every occasion. On the other hand, they also offered attractions to get people involved with the vehicles and the different companies. Such as Hyundai had a game show where they offered up prizes to contestants and the audience for stopping by their section. One of the popular attractions at the event is the obstacle course outside that is done by both Jeep and Toyota. 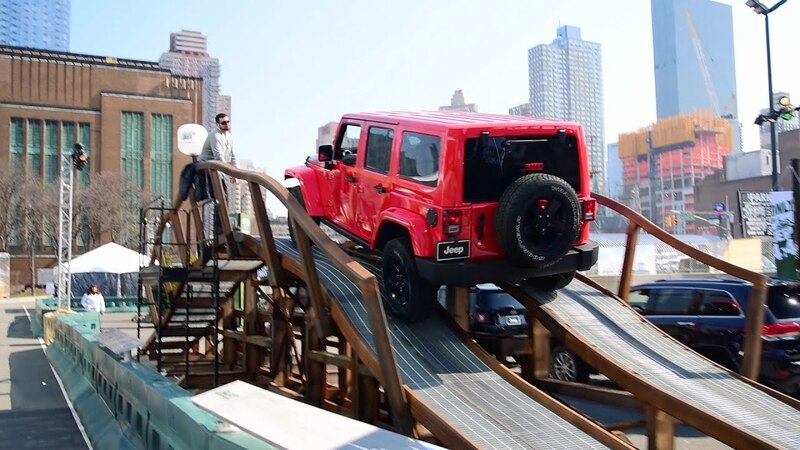 On these courses, visitors enter one of their great off-roading or strong trucks and go through obstacles as stairs, or even an 18-foot wall. Whether you are a car fanatic or just a person who happens to have a license, you will enjoy the auto show. It is a great experience for both families and those who love cars. If you have a chance and any desire to see the nicest cars in the world, stop on by and enjoy.